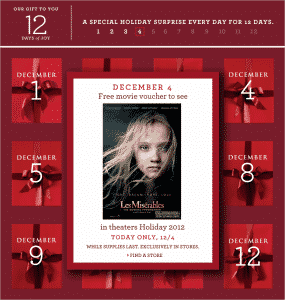 If you happen to have a Banana Republic near by, you can stop in today to score a free movie voucher to see Les Miserables. You can click here for more info. It looks like you don’t have to purchase anything to score this, but you might want to call your store to confirm before you head out. Voucher is valid for up to $10 towards the purchase of a movie ticket to Les Miserables at participating theaters on or before 1/31/2013.